IDEAL FOR HOLDING DEVICE ALOFT with APPS FOR BLIND OR VISUALLY IMPAIRED AND MOTOR DISABILITIES. WORKS GREAT WITH SEEING AI AND KNFB READER! PORTABLE DEVICE STAND: $34.99, free shipping. to view or photograph with apps on your device. Your device is held steady with permenant rubber feet as you slip the target item underneath to view, photograph or magnify or for digital record keeping. The stand is constructed of a plastic adjustable tray and sturdy wooden legs, to ensure a steady position when tightened, and is foldable for storage or portability. 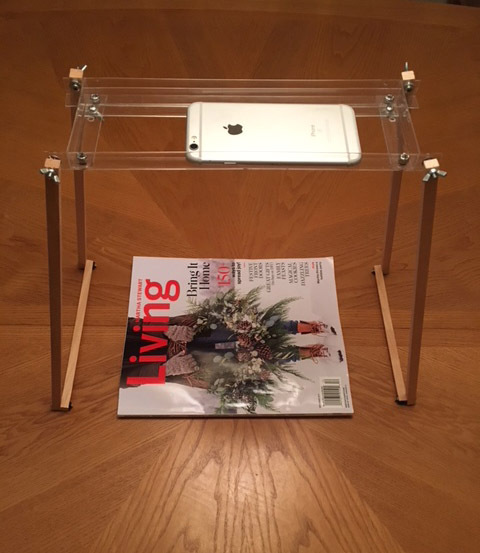 This stand can be a tool for the blind or visually impaired community as you can use it for accessible smart phone magnification and reading apps, such as magnifier, KNFB reader and Seeing AI. This will also help the users with motor disabilities to hold their device still to store their documents electronically, deposit checks to banks and possibly many other uses. It now has room for the power cord to use while charging. Please use Pay Pal button below.